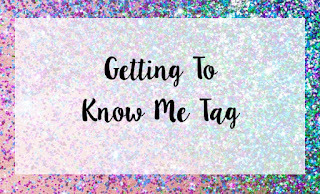 I did the Christmas Tag (which you can read here) earlier on in Blogmas (have no idea what Blogmas is? 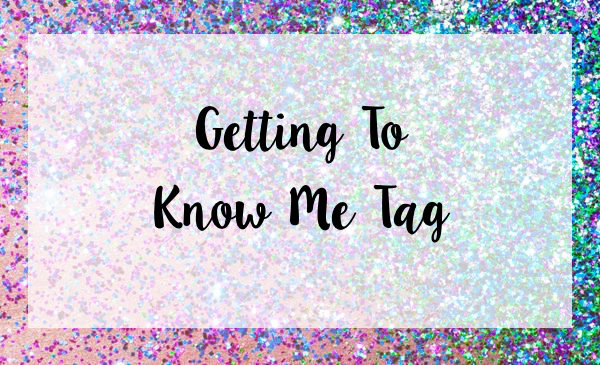 Guide your eyes here) and that was fun, so I decided to let you all get to know me a bit better by doing the Getting To Know Me tag that I saw on Amys Thoughts, even though I wasn't actually nominated! Let's get to the answers. It's a mixture really. It's curly when I've just got out the shower but gets a bit straighter once I've brushed it. I don't dye my hair a lot, but if I did I would do it myself at home, providing I didn't get the dye everywhere. Most days I just brush my hair and leave the house. Somedays I'll straighten it, but that's really it. I'm not one to experiment with hairstyles particularly. I don't wear a lot of makeup either (shock I know!) but if I am, it usually takes me between 15-20 minutes. I do it differently every time, depending on how much time I've got. Do you collect makeup or buy it when you need it? I buy it when I need it, usually as a treat or if something gone off and needs replacing. I don't wear them at all, I'm blessed with long and thick eyelashes, so I don't need much mascara and certainly don't need false lashes. Mascara, a bit of concealer and foundation and lip gloss - I can't be doing with all that contouring. Do you wear makeup when you're home alone or with family? Neither really, I usually only put makeup on for a special occasion or if I want to be a bit more dressy and want a change from my usual no makeup look. I have a MAC blush and lip gloss, but that's it. Everything else is drugstore stuff. Do you plan your OOTD the night before or when you're getting ready? When it's just a usual weekday I'll decide when I get up, or if I want to dress up a bit more I'll decide the night before. But if it's a special occasion, I plan it the night before. I don't have one handbag, so never. I use backpack or shoulder bags all the time, especially being a student - I probably couldn't afford any anyway. How often or when do you workout? I try to run at least twice a week and next year I'm definitely going to try to stick to that, as my fitness regime has been suffering as of late. I try to run really early in the morning, as it sets me up for the day ahead and lets the endorphins flow so I feel energised for the rest of the day. I can say a few nouns and greetings in French, but that's it. Daisy Dream by Marc Jacobs. I read them all and appreciate every single one. Do you keep a list of products that you seen on other posts? Not really, but if someone recommends something and I see it in the shop, then I will have a look at it and see if it's right for me to buy. I use my Canon 110d. It's 4pm here, so I'll probably just chill on the sofa writing (like I am right now) and have dinner about 7pm, then chill some more and go to bed sometime between 10pm and 1am. Those are my answers to the tag questions. I tag anyone who wants to take part - have fun! Great answers! Ive never tried the daisy dream purfume I'll have to get a tester when Im next out.